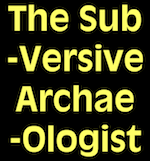 The Subversive Archaeologist: Thank you, Svante Pääbo and Your Accolytes for Settling The Matter of When the Human Lineage Acquired that Neanderthal DNA! Thank you, Svante Pääbo and Your Accolytes for Settling The Matter of When the Human Lineage Acquired that Neanderthal DNA! A tip o' the hat to Brendan Culleton (old friend) and Iain Davidson (older friend) for tonight's mill grist. I hope I can in some way cast doubt on it, even if it contains no calculations that I can possibly comprehend, and more genetics mumbo-jumbo than, I'm sure, most of you would comprehend [please let me know if I'm wrong, there]. Luckily for me, the authors employ some fairly squishy factors in coming to their conclusions. Moreover, they completely misunderstand the issues surrounding the question of whether or not Mousterians 'R' Us! Briefly, the authors think that they can accurately measure the probable last time that Neanderthal-like things mated with Us-like things, according to the degree of ... well ... genetic stuff in the Neanderthal and the modern human genomes. As I said above, I'm very glad that I don't need to be critical of the authors' findings and calculations. All I need do is talk about the probable cultural capacities of the two palaeospecies involved. To wit. The narrowest date range that Sankararaman et al. report is 47,000 to 65,000 years ago. To my way of thinking that's perfectly all right. No problem. It's so all-right that I think I could kiss them for figuring this out [if in fact they're correct]. See...it comes down to the cultural capacities of the critters that did the canoodling during those times. I grant you, there are disagreements on just that issue. But, bear with me. At about 100 ka we see skeletally modern hominids at Qafzeh Cave (Israel). About 35 ka later, there are Neanderthals a few kilometres away, in Kebara Cave. Both were employing what we like to call a Mousterian lithic technology. Again, depending on whom you're listening to, that could mean either that the critters were just like you and me, or not. The point is this. As long as the earliest evidence for people like you and me in northeastern Africa and western Asia (which includes Europe, Dopey!) is younger than than the latest date for interbreeding between the modern morphotype and the archaic one [sorry, Neanderthal Guy], I can rest comfortably. That's because when the interbreeding would have taken place they were both still 'Them' and not 'Us.' We may be the inheritors of Neanderthal DNA from that late temporal window. However, all that we know for sure is that it was pairs of two cognitively similar Mousterian individuals who were doing the wild thing, and not, as the authors would have you believe, someone like me and a Mousterian female. I s'pose I should acknowledge that there are all those discoveries of putatively 100 kyr old modern human behaviour in a number of south African cave sites. My position on those old dates is a matter of record. I think they're kak. And that's the way it is, on the eve of the one-year anniversary of the Subversive Archaeologist. See you on the morrow!